Justin Wilson took over Kansas City's legendary Soundtrek production studio after one of its founders, Ron Ubel, died in 2016. Justin Wilson is engaged in a consequential fight against irrelevance. As the owner and operator of Sound 81 Productions, a recording studio in Riverside, Missouri, his life's work is imperiled by a pair of existential threats. Not only do laptops and smartphones contain recording equipment that threaten to make conventional studios irrelevant, the low-fidelity sound of many current hitmakers is part of their appeal. "Absolutely, we're a relic," Wilson says. "I'm not afraid to admit that." Wilson is the region's most sought-after jazz engineer and producer at a time in which the genre's commercial viability has bottomed out. The jazz artists who rely on Wilson to document their music in crystalline fidelity include vocalist Molly Hammer, trumpeter Hermon Mehari and saxophonist Logan Richardson. They’re among Kansas City’s most respected musicians, but their popularity is dwarfed by the muddy sound of current chart-toppers such as 21 Savage, Post Malone and Lil Pump. Wilson is unwilling to chase that trend. "I could make a record in the weekend and sell it," he insists, but "I don't want to spend my energy on it." Rather than collaborating with chart-bound rappers, Wilson vets his clients and frequently turns down work from party-minded artists. His reluctance to invite raucous musicians into his studio is understandable to anyone who's been inside what he calls "the spaceship." From the outside, Sound 81 looks like most of the other contemporary houses in a quiet Riverside subdivision. Inside, however, is a state-of-the-art recording studio with high ceilings, mood lighting and airtight isolation booths. Sound 81 is the realization of a lifelong dream. 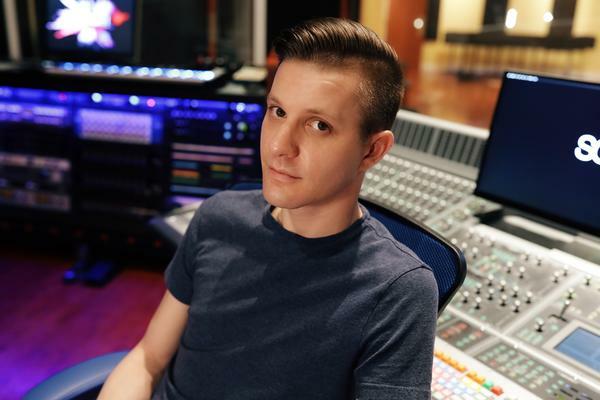 Wilson grew up in Lawrence and Columbia, studied music production and engineering at Full Sail University (a top trade school in Florida), and interned with Sony Music in Chicago. But a corporate shakeup limited his prospects, so he came back here to regroup. His high school band teacher introduced Wilson to Ron Ubel and Grant Schainost, the principals at Soundtrek Studios. Soon after the men took Wilson under their wings, the trio became inseparable. "I spent 24/7 with Ron and Grant," Wilson recalls. "They literally were my best friends and my family. It was never really a professional relationship." Before founding Soundtrek in Kansas City in 1981, Ubel engineered the first few groundbreaking Mannheim Steamroller albums in Omaha in the late '70s and early '80s. By the time Ubel and Schainost invited Wilson into their lives, Soundtrek had become the go-to studio for Kansas City jazz artists like Jay McShann, Mike Metheny and Karrin Allyson. "It became a legendary studio in town," Wilson recalls. "And they maintained that for many decades." Becoming a part of that legacy compelled Wilson to forgo creature comforts while mastering his craft. "I worked for room and board," Wilson recalls. "I never got a paycheck. I never got a salary. I gave up everything in my life and I lived for pennies. My reward was taking on the studio to carry on their legacy and to build mine on top of it. It was literally part of the family business that I was invited into because of my talent. They were going to retire and shut down the studio, but they're like, 'We want to pass the torch to you.'" With guidance from his mentors, Wilson began construction on the new studio in Riverside. The planned transition sped up when Ubel died unexpectedly in 2016. "It was devastating for me when he passed," Wilson said. "That was a three-year transition that happened overnight." Wilson's mad scramble following Ubel's death and Schainost's retirement resulted in one of the finest studios in town. Hammer, an admirer of Wilson’s work, is grateful for the continuity Wilson has provided with Sound 81. "I feel like he recorded the majority of the jazz albums that have come out in the last few years," Hammer says, "and before that, probably, Soundtrek did. He's carrying on that tradition of Soundtrek being the primary jazz studio." "I love making jazz. I could record it all day," Wilson admits. While he's open to recording every style of music, his meticulous nature and insistence on perfection limits his client base. He has no patience for musicians he deems unprepared or untalented, describing such encounters like: "That $20,000 chain of equipment that you just sang into pretty much revealed that you have no talent right now. Maybe it's in there somewhere, but you didn't bring it today. And we didn't do anything wrong except just record a high quality version of some crap. I don't want to do that." Wilson defends his high standards. "People can call me egotistical. I don't care, because I'm not. My hand is always open. I'm willing to share every single piece of knowledge I have. When clients come in, they walk out different. I'm not just hitting buttons, I'm literally in tune the entire time that they're in session. It might not be everyone's cup of tea." Perhaps not surprisingly for someone of his temperament, Wilson is dismayed by the current musical climate. "It is completely possible to record something in your bedroom and to win a Grammy off of it," he says with a sigh. "That's the industry we live in. And it's a little disappointing." But some musicians are still willing to pay for what Wilson offers. "The need for studios are still there," Wilson says. "It's a different kind of need, but there's still a need for pros and professionals. Because you can't beat quality."